In recent years, there has been greater emphasis on making more sustainable and eco-friendly buildings. One organisation that is striving to do this is The University of Nottingham, which has started development on a new carbon-neutral laboratory using eco-friendly materials, including cedar cladding. 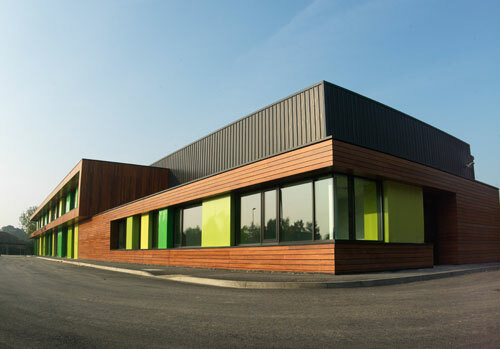 Not only does cedar cladding offer a deep, earthy colour that can uplift the cosmetic appearance of any building, but it’s kind to the environment and sustainable. Why use western red cedar cladding? Western red cedar is mainly grown on the west coast of Canada and the United States. Small areas are also grown in the United Kingdom . To ensure that your timber is sustainable, ask whether the timber is from a certificated source. Timber Merchants will use an awarding body such as The FSC (Forest Stewardship Council) or PEFC (The Programme for the Endorsement of Forest Certification), all Western red cedar from Canada should be PEFC endorsed. Although sustainable timber takes longer to grow, the quality of the product is usually excellent with fewer knots. Generally, fast-grown cedar, such as that grown in the UK, is more knotty and therefore more difficult to work with. The UK Government has a target of reducing 80% of the UK’s greenhouse gases by 2050, with greater pressure to design and build greener buildings. Wood is the only natural product that absorbs carbon dioxide out of the atmosphere, which makes timber-related products the perfect choice for architects, builders and property developers. Many have also used cedar and larch cladding to simply disguise an ugly wall by adding some character to the property. But in addition to this, cladding is an excellent thermal insulator and can help to reduce overall heating costs. Cedar cladding is highly versatile. Being a soft wood, it allows easy working and can be machined to your installation requirements and to a number of profiles, including: tongue and groove, shiplap and secret nail fix. Preserving the quality of cedar cladding is important. For that long-lasting fresh look, a UV protector can be applied. When unstained cedar cladding is exposed to direct sunlight, the product will gradually fade to a silvery grey colour. Did you know that cladding is available pre-stained or painted? This can save contractors or self-builders a great deal of time and therefore cost on projects. There are many great benefits of cedar cladding for a variety of projects, whether domestic or commercial. With greater pressure to meet CO2 emissions targets and to comply with corporate social responsibility, there is no doubt that cedar cladding will be an important sustainable resource for many years to come.